This is the story of an algae bloom killing aquatic life and blighting the beaches of Florida. 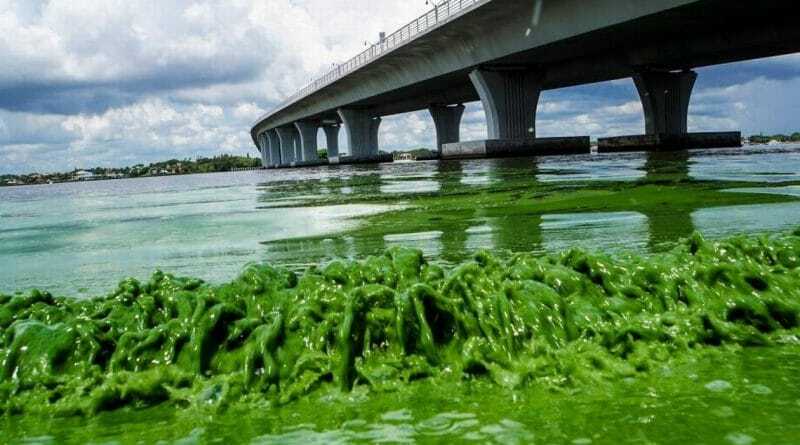 This is the story of the algae’s accomplice: Governor Rick Scott. On Florida’s rivers, the bright green algae forms. Then the wind blows it against the river bank or into coves and marinas, where it piles up into inches-thick foamy layers and is baked by the sun into a toxic cyanobacteria scum called microcystis. Signs in towns like Stuart — the “Sailfish Capital of the World” — warn, “ADVISORY. High Bacteria and Blue Green Algae. AVOID CONTACT WITH THE WATER.” Beaches are closed. Amid the fish kills, paddle boarding and kayaking as well as fishing are suspended. “When the wind’s right, the air just gags you,” says a resident. People complain of rashes, nausea, diarrhea, inflamed eyes, and irritated throats. What happened to the pristine beaches? The administration of Governor Scott, a climate-change denier. Scott has rolled back safeguards such as septic-tank inspections that ensure waste is not seeping into water systems. He cut almost $700 million in funding for the protection of waterways. He appointed water management board members whose interests lie with polluters rather than with clean water. On June 26, Scott declared a state of emergency for four counties. But this year’s outbreak is not exceptional, only a severe version of the algae blooms. The Governor blamed President Obama and the “negligence of the federal government” for the slow progress in hardening a dike around Lake Okeechobee, with the Army Corps of Engineers opening spillways to relieve pressure on the earthen barrier. But Scott did not mention that the primary source of the pollution-laden water. Much of the bacteria is from farm runoff, particularly from sugar cane fields. Earlier this year, Scott signed a law essentially allowing agricultural producers to police themselves over fertilizer pollution. And Scott’s appointees on the South Florida Water Management District have withdraw plans to buy 46,800 acres of sugar company land for giant retention ponds to store and filter polluted lake water. On Wednesday, Scott’s office said the Governor seek money in next year’s budget for matching funds “to encourage residents to move from septic tanks to sewer systems in order to curb pollution”. The office did not mention the issue of farm run-off.